Does the universal cop have a beat? So, I might be moving upstairs, and more importantly, I will have a garage. Many things can happen in this garage. I can go vintage. 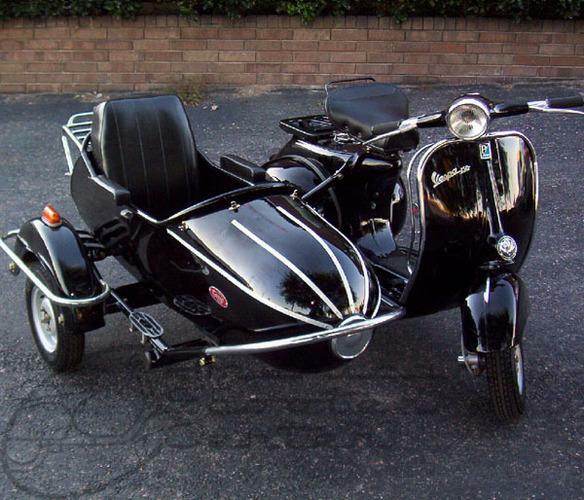 70’s Vespa Rally 200, anyone? 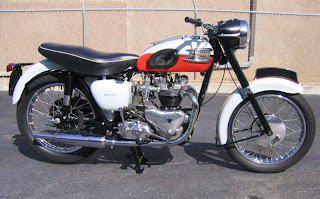 I can get a that Triumph Bonnie I’ve always wanted. Not one this nice, but one that could BECOME this nice. Hey everyone – I’m messing around with the blog format with colors and fonts, so it may be ugly and changing all day today. And by everyone, I mean you, the sole reader of this blog. I took my first real ride of the summer yesterday. 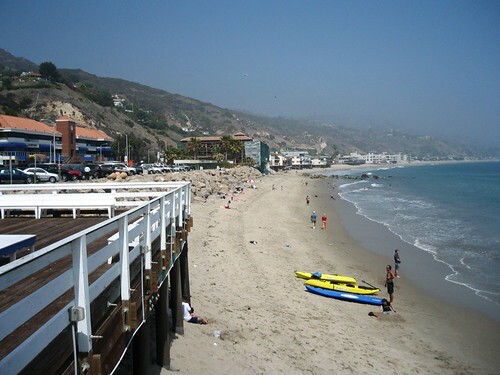 It was beautiful out, and I was going to go shopping in Santa Monica, but I decided to just keep riding up the PCH. 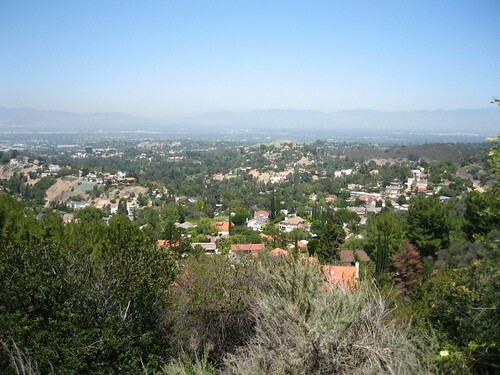 I went to the top of Pacific Palisades. It was a little hazy, but up there you are completely surrounded by mountains. I barely saw any cars on the road up there. 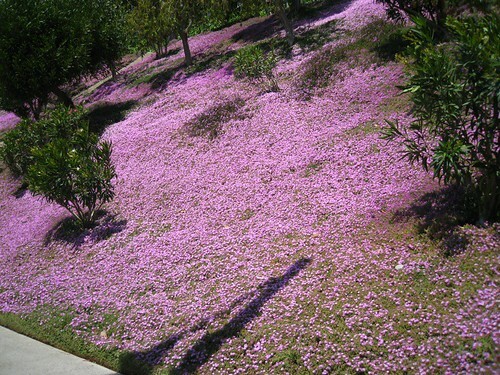 These little purple flowers were everywhere up there. You could smell them from the road. When I stopped to take this picture, I could see thousands of bees. I was wondering what kept hitting me in the chest as I drove by these. I’m glad one didn’t get into my helmet! 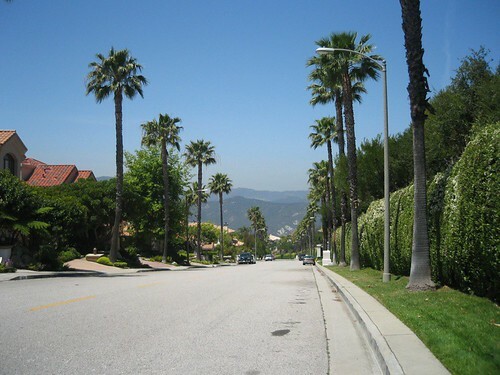 I eventually got back on the PCH and went up a road which brought me to Mulholland Drive. 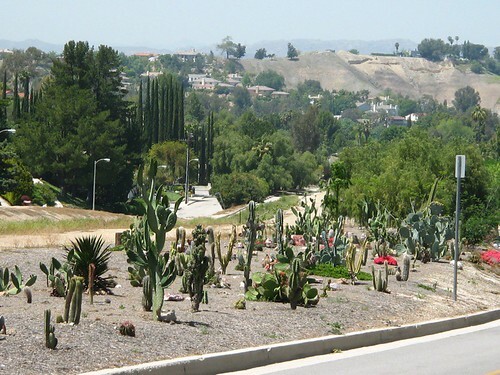 This is a cactus garden off Mulholland. 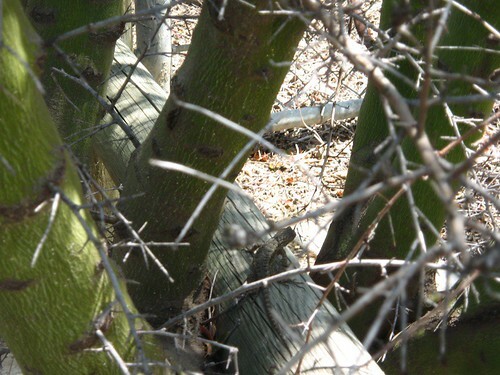 It was very arid here, and I was surprised at all the different climates I would experience in a two hour ride. After Mulholland, I got back on the PCH and headed for Topanga Canyon Road. This ride is the most fun, and I think I saw at least 50 motorcycle mamas and papas going up and down. Lots of leather, scruffy beards, and little black helmets. This is actually the second time I took Topanga that day. When I started up the road, I noticed that I had forgotten to get gas, and my gas light was starting to blink. 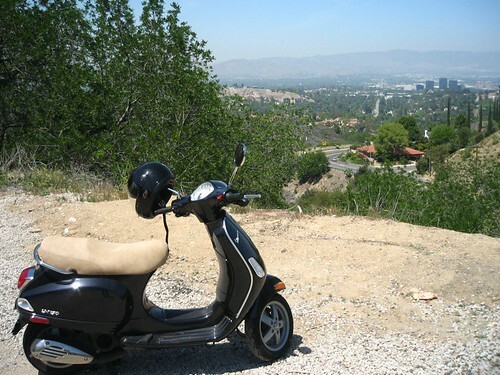 I decided to just go all the way up the canyon to the town of Topanga, because surely they would have gas. They didn’t! By this time my gas light was on steady now, meaning I was very low. I headed back down Topanga Canyon Road to the PCH. I had to head about a mile south before I hit a gas station. I thought for sure I was going to run out! I guess the reserve is a little bigger than I thought. This is taken on a turnout on Topanga, where I stopped and ate some pistachio nuts. It was at least 10-15 degrees warmer here than on the coast. I took my jacket off and enjoyed the heat. The warm air brought down the smell of juniper and sage, it made me hungry. On the turnout, I explored a little and saw a little rabbit who was too fast to get a picture of, and this lizard – Mr. Lizard. Finally, I met back up with the PCH again and headed up to Malibu. I found a place to park and walked down the pier and snapped this. There were a ton of people out, but most out swimming or surfing. It is amazing that I could experience desert, forests, mountains, and beach all within minutes of each other. It was a great ride! There are a few other pictures I didn’t post here, as well as these pictures full size on my Flickr photo set. It is friday, and I’m about to leave work. Listen to some Joe Strummer this weekend if you haven’t. He’s my hero. Try and rent “Let’s Rock Again” and give it a watch. Remember Joe!!!! Oh yeah, I also read a Scooter Blog called: ScooterDave! Oh, hello again. Just hanging out at work. I thought I would post some sausage links, minus the sausage! Here are the blogs I check out daily. I know there is some sort of fancy website or service that can compile all the new posts from each of these into one handy page, but that just seems like too much work. I use a thing called “bookmarks.” In the future, these bookmarks will be made of holograms I bet. Dave’s awesome information about the Ural (now that I think about it, Dave, I think we’ve talked about these bikes before) got me thinking about rad sidecars. Yeaaaah. I love how there is even crash bars on the outside of the sidecar. It looks like it was made out of an old Spitfire! Rad! In other scooter news, I had a close call this morning. I was turning onto Lincoln from Venice, and I was leaning into the turn, and my center stand started to grind on the ground because I was leaning so sharp into the turn. It started to pull my front end around, and I’m glad it was smooth road, because I was able to pull the bike up without getting squirrelly. It looks like Saturday will be the day for working on my Scooter, if my turn signal kit comes in on time. I’ll take pictures. I got a haircut yesterday, but it is too short. It will be fine in a week, but GOD DAMNIT. Tonight I’m going to a warehouse party downtown with a bunch of bands. Shouldn’t be a late night, but should be fun. I’ll take pictures there too. Pictures, pictures, pictures. PICTURES PICTURES PICTURES. Do you even want to see the pictures? I take them for myself! I did the delete last night. The phone was too overloaded with phone numbers! So I did the delete. Essentially, when I delete a number, it is basically saying “I never want to talk to you… ever again, in my entire life!” Don’t worry, reader! I didn’t delete your number! I love you! Unless, of course, you are a stranger (then I love you just for reading) or you are someone who doesn’t like me, but chooses to read this blog anyway (I don’t like you, and I deleted you). Here is the part where I try to decide whether to click “PUBLISH,” or I decide to keep writing.